With more than 125 installations in Bozeman and the surrounding region under our belt, we understand the little details that make efficient heating systems work well, look good, and last for decades. Gardiner, MT - Probably the most scenic site we have worked! 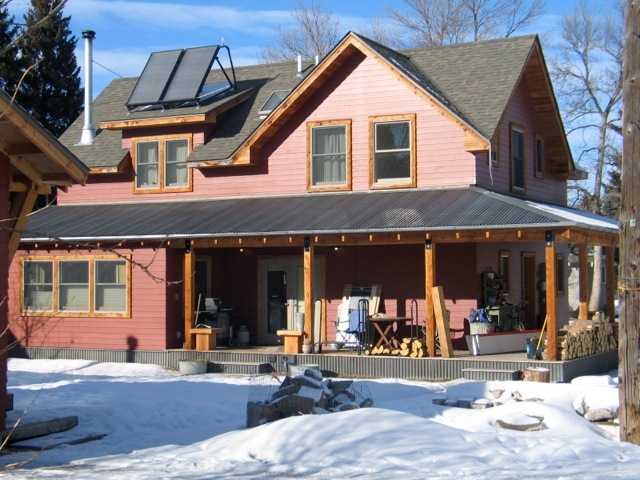 This system has a 500 gallon storage tank that accepts heat from both 240 SF of solar heating panels (drainback) and a heat exchanger inside a masonry stove. 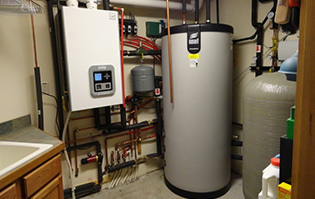 System provides hot water for the house and two rental apartments as well as heat for radiant floor. 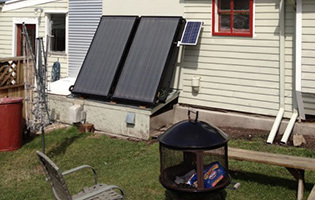 An electric on-demand water heater provides backup heat if solar and masonry stove cannot meet the demand. 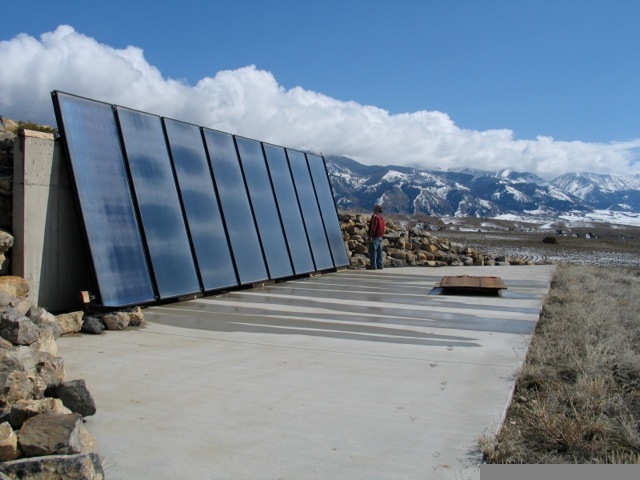 Springhill Area - Bozeman, MT - Installed in 2008 this large solar array provides is tied to a 550 gallon solar storage tank and assists with radiant heating all winter and meets 100% all the hot water demand for the home between May and October. We have a web-based data logging of all system temperatures and performance. Please contact us if you would like to see real time performance data. Clyde Park, MT - Owner had complained of a noisy 12-year old cast iron boiler and high propane bills. 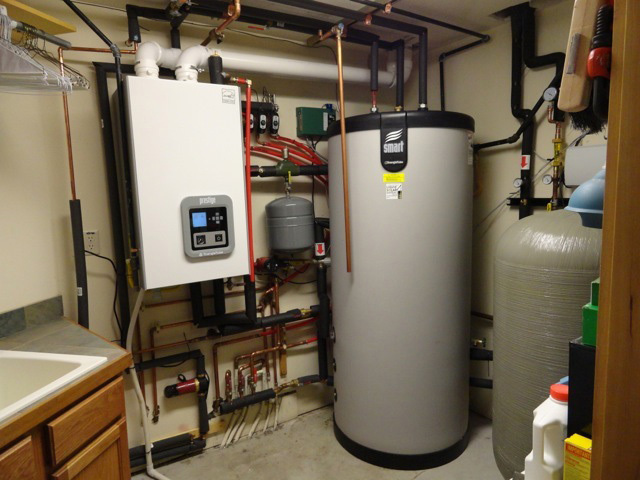 We used an innovative, simple design with a 175 gallon european tank as "thermal center": Tank accepts heat from a 160 SF solar array and high efficiency boiler to provide energy for both radiant floor and domestic hot water with minimal pumps/controls. Through the first 8 months propane consumption dropped by 55% and the owner loves the quiet, reliable, efficient system. 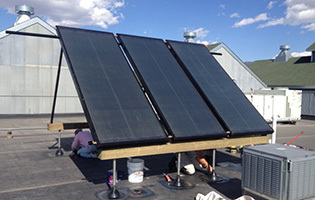 Community Food Coop | Bozeman, MT - As part of the design phase of this project we installed a flow meter to determine daily hot water consumption (about 180 gallons/day) to ensure proper sizing. 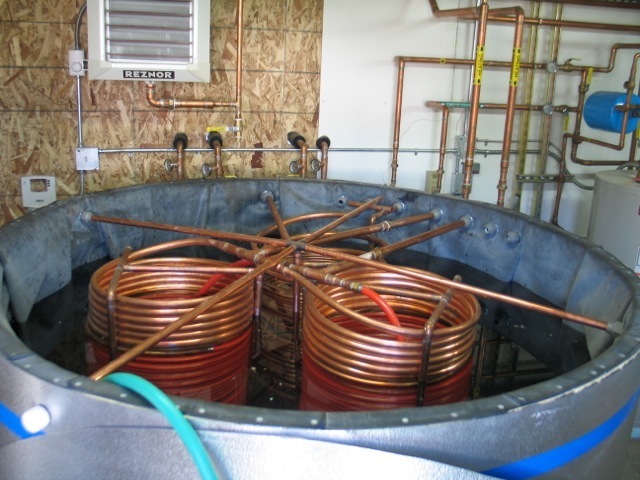 In addition to solar hot water, waste heat from the refrigerant system assists with water heating. We also installed a 96% efficient backup water heater for when solar and refrigerant cannot meet demand. Way to walk the talk, Coop! 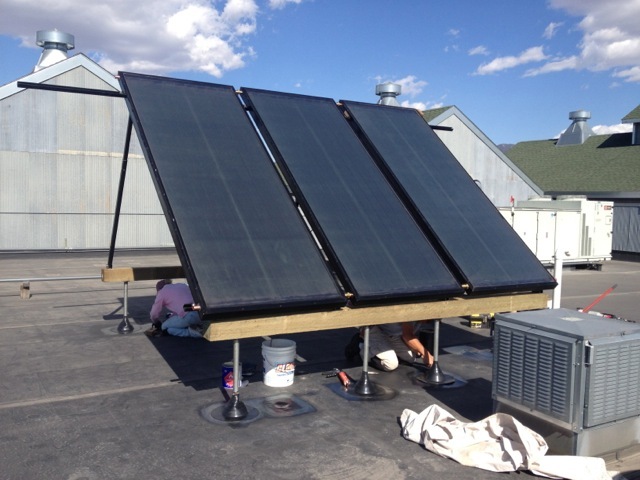 West Yellowstone, MT - An awning-mounted solar hot water array (2 Sun Earth 4x8 collectors) that routinely sees temps winter temps below -20F. The owners report good performance on even the coldest sunny days of winter! 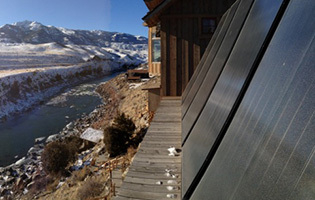 Kelly Canyon - Bozeman, MT - Two Sun Earth 4x6 ft flat panel collectors tucked into a south wall provide 60 to 70% of the hot water needs for this home. 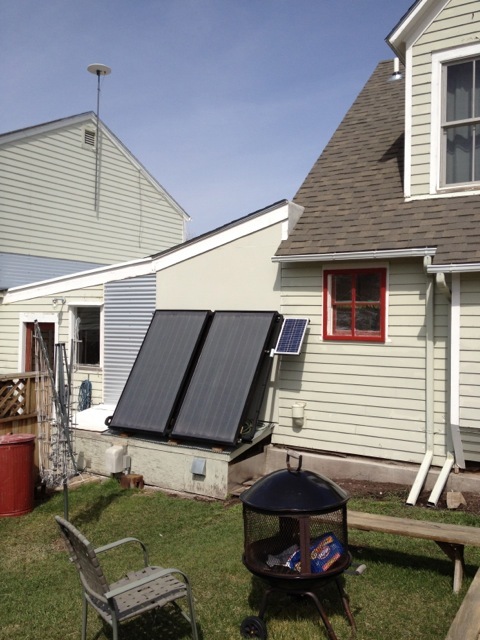 The small 30 watt solar electric panel on the upper right powers a DC pump for circulation of the solar heating loop that is tied to an 80 gallon solar tank. The DC pump is independent of the the power grid for maximum efficiency and reliability. 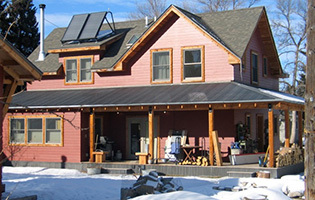 Bozeman, MT - A typical roof mounted solar water heating system. These two 4x6 Sun Earth flat panels are tied to an 80 gallon tank in the mechanical room. 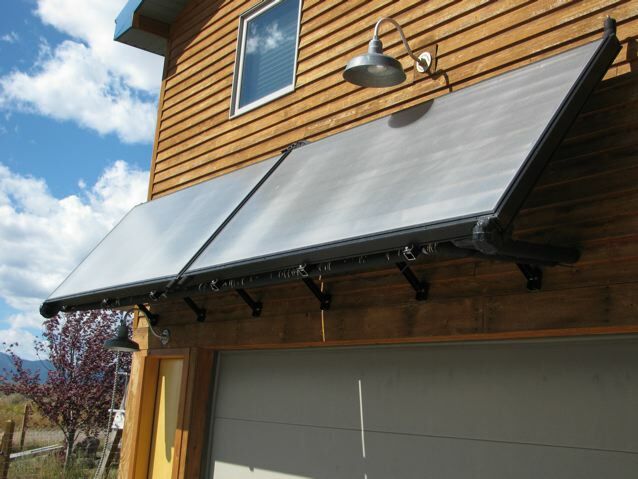 The solar tank supplies the natural gas water heater with pre-heated water that reduces energy associated with water heating by up to 70% on an annual basis. The collectors are mounted at 50 degrees so that snow is easily shedded. 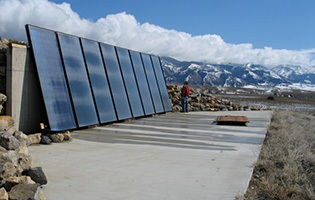 Paradise Valley, MT - This is an 800 gallon non pressurized solar storage tank. It is tied to 12 Sun Earth 4x10 collectors configured for drainback. Large tanks are beneficial when the demand for space heating comes later in the evening (in this case because the house has good passive solar gain during the day). The backup propane water heaters can be essentially turned off for 4-5 summer months with such a system. 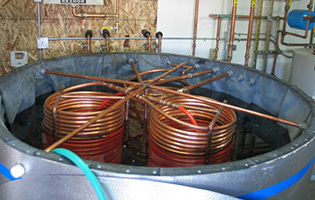 Pass-through copper heat exchangers are shown in the tank. European Panel Radiators - We love these radiators and have them at our home and office. 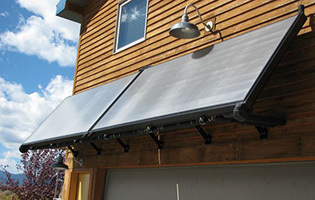 This type of heat "emitter" can be sized to work well with solar heating, is very quiet, comfortable, and affordable. They look pretty good too. 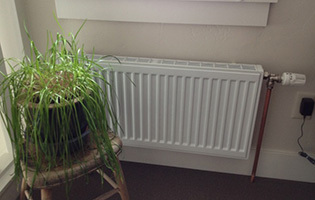 They can replace the standard baseboard radiators and allow boilers to be set at lower, more efficient temperatures. Other brands and models available; including slick bathroom towel warmers.